Provide comfort for the family of Samuel Dundore with a meaningful gesture of sympathy. 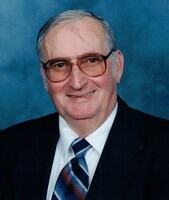 Samuel Lester Dundore, 82, of Hummelstown, entered eternal rest on Wednesday, January 30, 2019, at his home. Born in Quentin on December 27, 1936, he was one of thirteen children of the late Elmer and Iva Binner Dundore. Sam retired as a custodian from the Lower Dauphin School District after 30 years of service; and also worked as a custodian at his church, Trinity United Methodist Church, where he served as Head Usher. He enjoyed helping with activities at the Quentin Fire Company. A scrapper on the side, Sam liked to watch Westerns on television and do crossword puzzles and word searches. He is survived by his wife of 56 years, Janet E. Crater Dundore, whom he married on August 25, 1962; two daughters, Bonnie L. Hoffer and Mary Ann Dundore, both of Hummelstown; two sons, Bryan E8. Hinkle husband of Nancy of Grantville, and Scot L. Dundore husband of B. Lynn of Oberlin; four brothers, Raymond Dundore of Quentin, Elvin Dundore of Sporting Hill, Christian Dundore of Hershey, and Luke Dundore of Sinking Spring; two sisters, Arlene Wagner of Fontana, and Lucille Dundore of Palmyra; twelve grandchildren; eighteen great grandchildren; and one great great grandson. In addition to his parents, Sam was preceded in death by a grandson, James Samuel Dundore; four brothers, Allen, Harold, Paul and Earl; and two sisters, Ellen Snyder and Violet Kimmel. Funeral services will be held Thursday, February 7, 2019, at 11 AM in Trinity United Methodist Church, 210 West Main Street, Hummelstown, with The Rev. Robert J. Kazinski, his pastor, officiating. Interment will be in Woodlawn Memorial Gardens, Lower Paxton Township. Viewings will be Wednesday, February 6, 2019, from 6 to 8 PM in the Trefz & Bowser Funeral Home, Inc., 114 West Main Street, Hummelstown, and Thursday in the church from 10 AM until time of the service. Those desiring may send memorial contributions to “Homeland at Home, Hospice”, 2300 Vartan Way, Suite 270, Harrisburg, PA 17110; or to Trinity United Methodist Church, 210 West Main Street, Hummelstown, PA 17036; or to a charity of your choice. To send flowers in memory of Samuel Lester Dundore, please visit our Heartfelt Sympathies Store. Provide comfort for the family of Samuel Lester Dundore by sending flowers. Condolences to the Dundore family. Our thoughts and prayers go out to your whole family. Psalms 147:3 says God, "heals the broken hearted, and binds up their wounds." May God bring you comfort and peace. You have my deepest sympathy. I remember Sam as our wonderful janitor at school and at church. I loved his sarcasm and love of family. I also know he was a dog lover from when I lived in the alley behind him. Heaven gained a beautiful soul! Hug my son for me.